ALISO VIEJO, Calif., Jan. 4, 2018 - Microsemi Corporation (Nasdaq: MSCC), a leading provider of semiconductor solutions differentiated by power, security, reliability and performance, today announced it was honored with an Electronic Products' "Product of the Year" award for its lowest power, cost-optimized mid-range PolarFire® field programmable gate array (FPGA). Now in its 42nd year, the annual awards program recognizes the industry's best new products. Electronic Products, owned by the media group AspenCore, undertook a rigorous vetting process of products launched in 2017. The winners were selected on the basis of innovative design, significant advancement in technology or application, and substantial achievement in price and performance. Microsemi's PolarFire FPGA was recognized for delivering the industry's first non-volatile mid-range FPGA with tangible power and cost benefits over SRAM FPGAs featuring 12.7 Gpbs transceivers. "We are excited to be recognized by Electronic Products with its 'Product of the Year' award, as the magazine has been a go-to resource for design engineers seeking the latest in product technology for more than 50 years," said Suresh Menon, vice president of engineering at Microsemi. "This prestigious honor not only validates our leadership in delivering a truly innovative FPGA product family that transforms the way the market thinks about traditional mid-range FPGAs, but also acknowledges our team's ability to provide the differentiation necessary to meet our customers' ever-evolving requirements." The 2017 Product of the Year Awards were announced in the January 2018 issue of Electronic Products with a cover feature and details on each product. Additionally, the winning products appear on Electronic Products' website: http://www.electronicproducts.com/ProductYear.aspx. "Our PolarFire FPGA family adoption is continuing to build momentum. With engineering samples shipping since mid-2017 and production available in early 2018, key customers developing communications, industrial and imaging applications are already successfully designing with PolarFire devices," said Shakeel Peera, vice president of product marketing at Microsemi. "The recent release of Libero SoC PolarFire v2.0, new lower cost Microsemi and distributor kits, and additional solutions to help customers ramp designs faster will continue to accelerate PolarFire usage in low power mid-range FPGA designs." Microsemi's new cost-optimized PolarFire FPGAs deliver the industry's lowest power at mid-range densities with exceptional security and reliability. The product family features 12.7 Gbps transceivers and offer up to 50 percent lower power than competing FPGAs. Densities span from 100K to 500K logic elements (LEs) and are ideal for a wide range of applications within wireline access networks and cellular infrastructure, defense and commercial aviation markets, as well as industry 4.0 which includes the industrial automation and internet of things (IoT) markets. 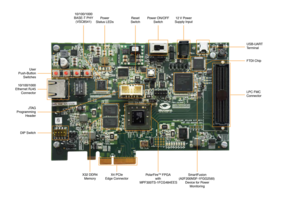 PolarFire FPGAs' transceivers can support multiple serial protocols, making the products ideal for communications applications with 10Gbps Ethernet, CPRI, JESD204B, Interlaken and PCIe. In addition, the ability to implement serial gigabit Ethernet (SGMII) on GPIO enables numerous 1Gbps Ethernet links to be supported. PolarFire FPGAs also contain the most hardened security intellectual property (IP) to protect customer designs, data and supply chain. The non-volatile PolarFire product family consumes 10 times less static power than competitive devices and features an even lower standby power referred to as Flash*Freeze. For more information, visit www.microsemi.com/polarfire.